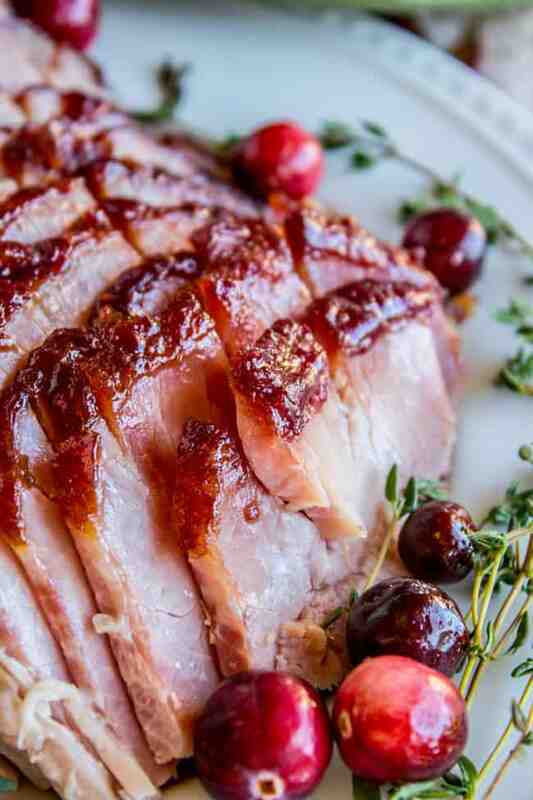 Ain’t nothin better than an oven-roasted homemade ham glaze I say. This recipe uses fresh cranberries, meaning it’s perfect for the holiday season! I love the zing that the dijon mustard adds too. 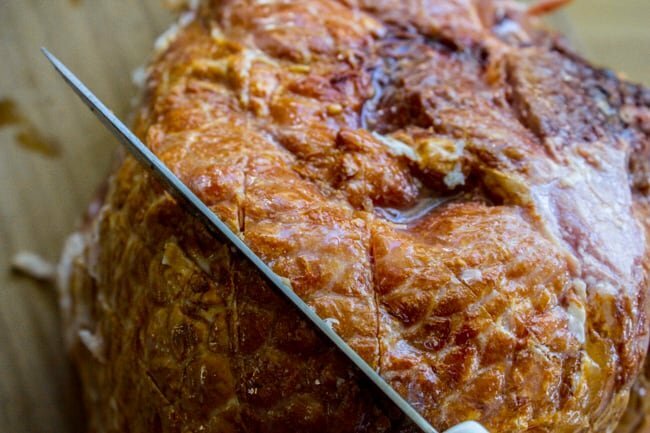 This recipe that shows you how to glaze a ham is super easy to throw together! Out of sheer laziness, Eric and I have managed to convince our kids that “milk-water” is a thing. Like if they finish their milk at dinner and want some water, we don’t rinse out the cup. Tonight I poured Charlotte’s water for her and she goes, “It looks like a swamp!” Why yes dear. Yes it does. Drink up. My parental neglect is only going to get more pronounced over the next few months. 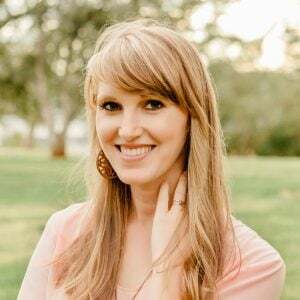 I just had my 3rd kid a few days ago, which means that I’m slowly morphing into an extension of my couch (because all I do is nurse the baby.) Ain’t nobody got time for cup rinsing. Or bathing children. Or taking them to school. Just kidding, I swear Charlotte makes it to school every day. Mostly because my mom is here helping us out. Thanks mom! My friends keep asking me if having a third is way harder, and I say no way, Eric’s home from work and my mom is here to wait on me hand and foot. All I have to do is sit on the couch and never get any sleep. No prob. Ask me in 6 months how it is having 3 kids. Right now it’s a cinch. So are you guys getting your menus together for Thanksgiving?? I’m super excited for the holidays. Eric surprised me with a little Christmas outfit for Valentine the other day and I thought I would explode. I get a baby, plus I get to dress her up in Christmas clothes?? Okay sorry, back to Thanksgiving. Do you always cook a turkey? Do you make ham, roast, lamb, something else? 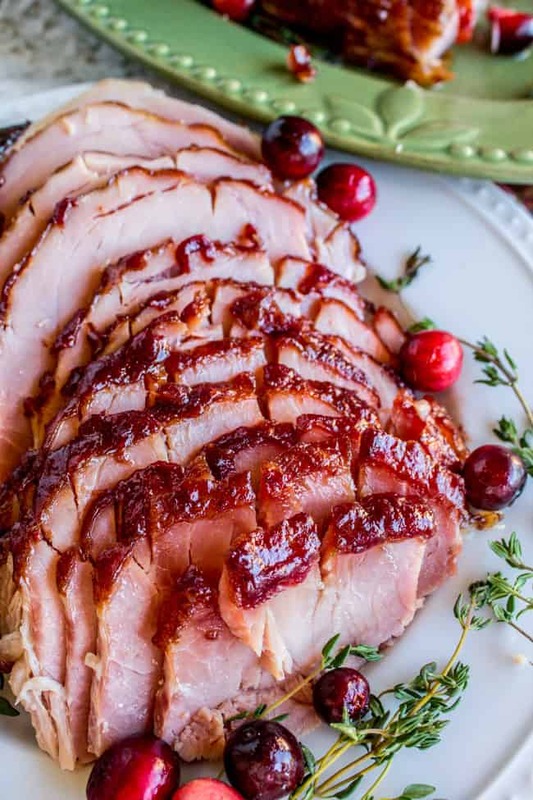 If your family loves ham this recipe is for you! It starts with fresh cranberries on the stove which are cooked and pureed with dijon mustard and some brown sugar. The sauce is super quick to make, and then all you have to do is get the ham in the oven and brush it a few times. Easy peasy. 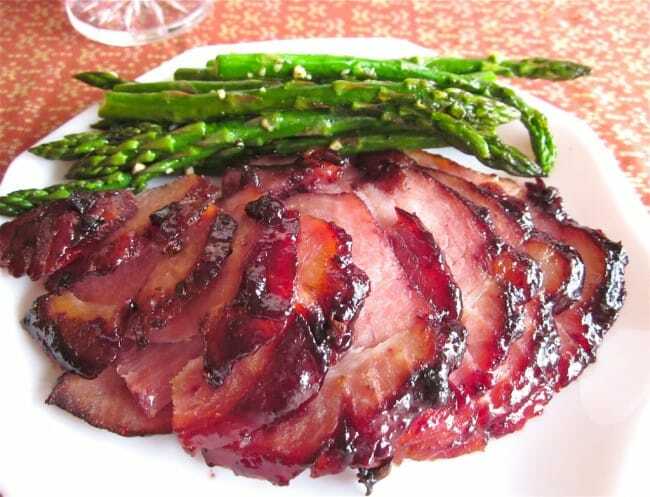 There is some cayenne pepper in the recipe, which gives it a fun little kick (reminiscent of this Raspberry Chipotle Glazed Ham). Score the ham with a sharp knife so the sauce seeps into the ham through the skin. If you don’t have an immersion blender to puree the glaze, you can use a regular blender no problem. 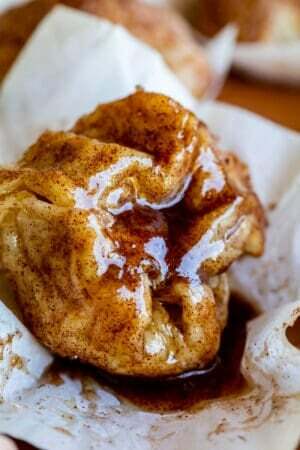 Check out some other Thanksgiving ideas below the recipe! Combine cranberries, water, and honey in a medium saucepan. Set over medium heat. Stir occasionally for about 4-5 minutes, until most of the cranberries have popped. Add dijon mustard, vinegar, brown sugar, and cayenne pepper. Continue to cook for another 3-5 minutes until the sauce has thickened some and is syrupy. Remove from heat. 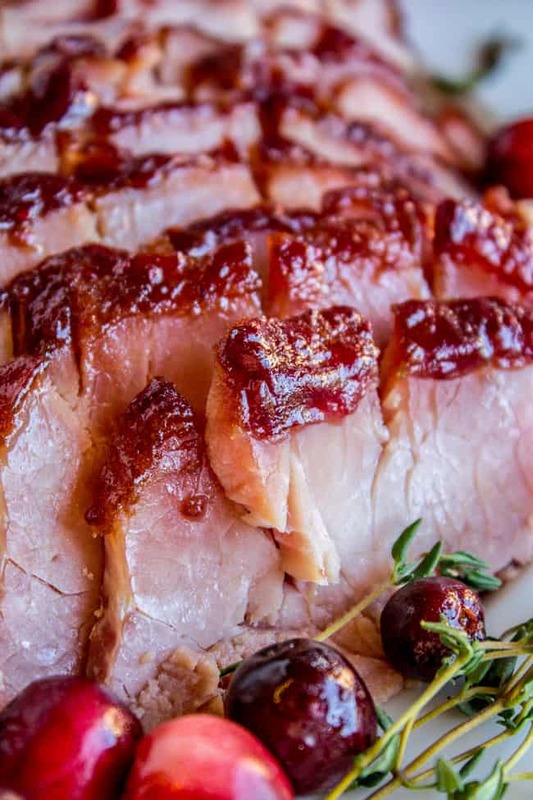 Place the ham on the roasting rack and use a sharp serrated knife to score the ham diagonally. Place the pan in the oven and roast for 1 and 1/2 to 2 and 1/4 hours, or until a thermometer registers 135 degrees F. (About 20-25 minutes per pound). (You don't need to worry about the temperature too much since the ham is already cooked. You just want to make sure it's hot all the way through. 20 minutes before you think it will be done, brush with sauce one more time. Source: This one’s from The Food Network, you know those inserts they have in the magazine sometimes? This one was called 50 Things to Make with Cranberries. The recipe’s not on the link though, I can’t find it online. 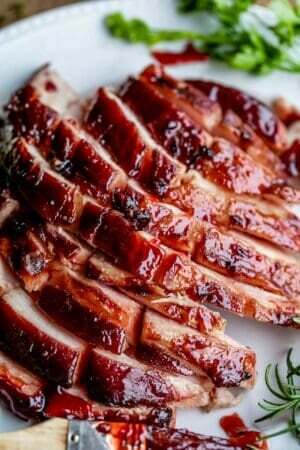 Here are some other ham recipes you will love! 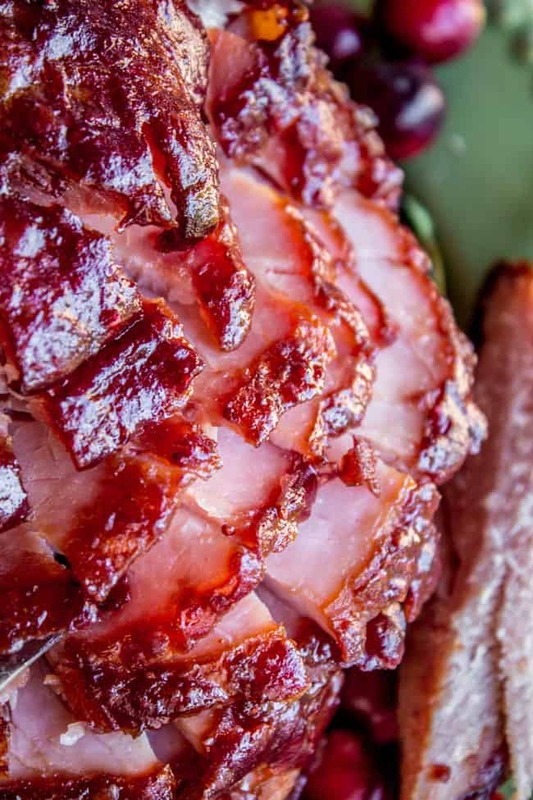 Raspberry Chipotle Glazed Ham << this is an old favorite of mine! It’s actually very similar to today’s recipe, just with raspberry and a chipotle kick. It’s good! 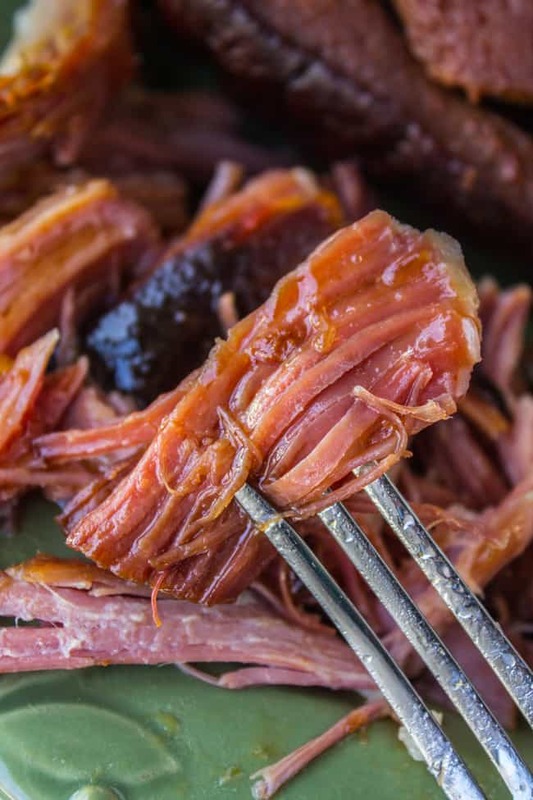 Easy Sriracha Ham (Slow Cooker, 3 Ingredients): << It seriously does not get any easier than this recipe. 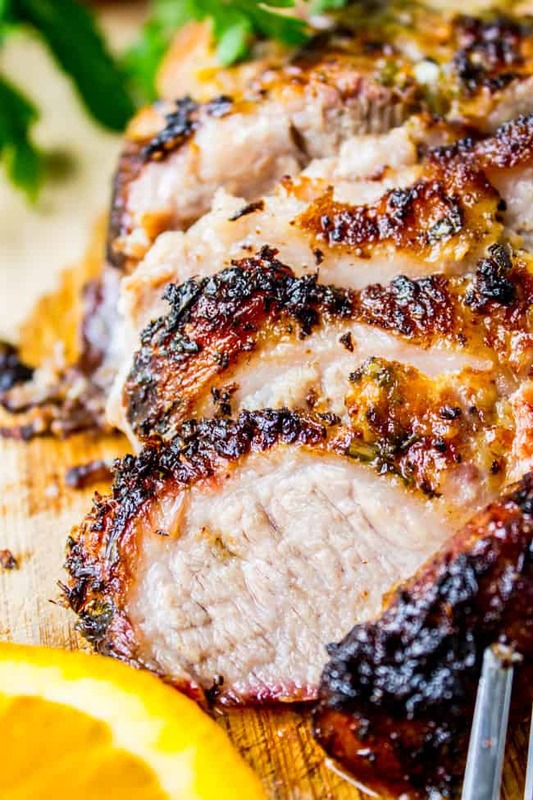 Cuban Mojo Marinated Pork: << This is the TOP recipe on my site. With good reason! Look at that crust!! A few other ham recipes from awesome bloggers! This post was originally published on November 9, 2016. AMAZING! 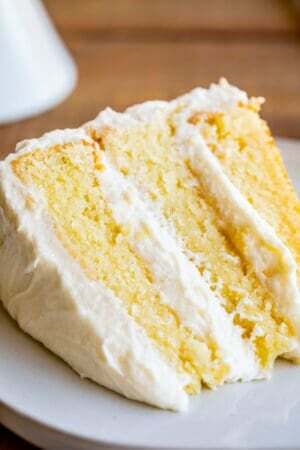 I’ve been looking for a glaze that was easy but not too sweet. The mustard and cranberries were the perfect pairings. I always have frozen cranberries this time of year so this was perfect. I did add just a bit more mustard since our family really doesn’t like our meat sweet but that’s a personal preference. March 2019–You should have seen me trying to find this recipe the second time..of course, it was the last place I checked. It’s currently with my “tried and true” recipes so it won’t ever be lost again. Carolyn you are so smart! I need to start freezing cranberries so that I can make this all year long! And I’m with you generally, I don’t like my meat too sweet. I’m working on another dijon recipe (for lamb!) that I will be posting soon, I think you will love it! I’m so glad you re-found the recipe for the ham. Thanks so much for taking the time to comment! Thanks! This looks amazing for the holidays! 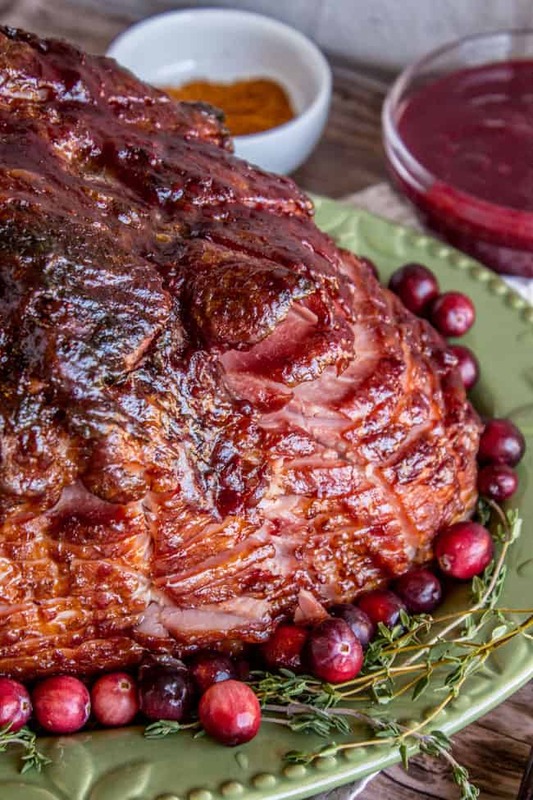 I saw a couple of cranberry glazed ham recipes recently but could not find them, but I found yours and it looks easy and good. I think I’ll try it this Christmas. Just in time for our Christmas feast. Haha! I’m so glad you are burning the midnight oil for the ham :) Enjoy! 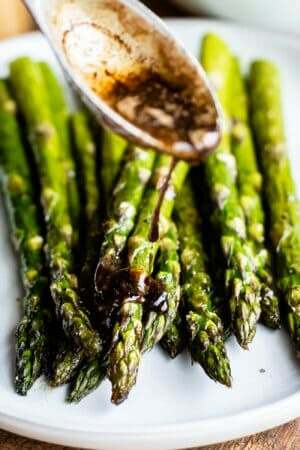 Hi, if we wanted to add an alcohol (like port) to the sauce, how would you recommend adding it in? Hey Aisha, I’m so sorry but I don’t drink or cook with alcohol so I’m literally the worst person for this question!! Let me know if you tried it out! Ooh that sounds delicious, especially with the garlic! Yum. I made this ham today for Easter! I’ll have to try your ideas next time! Thanks Dana! I’m so glad you loved it Ondie! I love cranberries too. I hoard them during the holidays. I freeze bags and bags and bags of them and then use them throughout the year! Cranberries freeze beautifully. Try it out! I want to know how would I a just cooking time using a fresh ham? Hi Rhason, I’m not sure, I would look up some cook times for a fresh ham and go from there! Good luck! This tasted great but looked terrible! I cut into the ham and it all fell apart (kinda like cutting an onion). Then I had to cut the whole ham in half and after that gave up with the diagonal cuts. If you could include more pics of how your ham was sitting i think that would help! Did you buy a pre-cut spiral ham Renee? That would explain why it fell apart like an onion. I’m sorry it didn’t look very presentable! Next time try buying a ham that’s not sliced? What did you serve with the ham? I ordered a super small ham and they sent me a pig. So…turkey is out for Christmas dinner. Hey Andrea! You totally can, I bet it would be good! I haven’t tried it. Has anyone tried using half orange juice and half water to boil cranberries in and also add orange zest to sauce. Ooh that sounds delicious Mike! Let me know if you try it out and how it tastes! I can’t see how it wouldn’t work out! Oh how fun! That is awesome Stephanie!! Are you making the ham?? Can you make the glaze ahead of time? A couple hours ahead? A day ahead? Oh yeah totally Leslie! I bet you could even make it several days ahead. I would warm it up when you’re ready to use it so that it brushes on easy. Enjoy!! Ooh, this ham looks good! I love the fresh cranberry factor, I bet that puts it over the top. :) Congrats on the birth of your baby girl! Ok first of all there is no shame in not rinsing out their cup, we never do and the kids hate it but oh well. The kids now get their own water so see less work for me, lol! This ham looks killer by the way!! Love the glaze! Your new little girl is seriously SO beyond adorable, Karen! Congrats again!! And this ham is seriously hitting that WHOA factor! Absolutely drooling over the cranberry glaze!! Congrats on your third bundle of joy, Karen! That’s so exciting! And milk water…I love it! 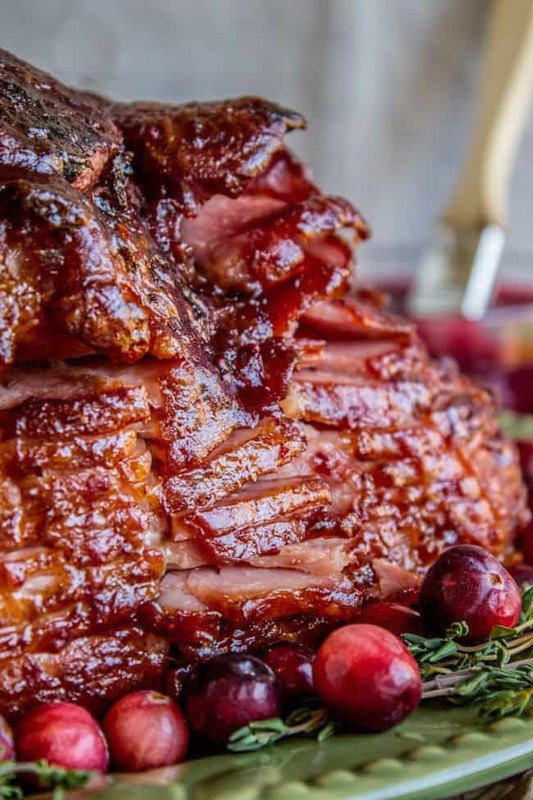 This glazed ham looks so good and so pretty with the cranberry glaze! Definitely something I need on my holiday table! Noooooo say it ain’t so Natalie!! Haha! Here’s hoping I survive! Love the fresh cranberries in here! Hey Jerrika! No I didn’t cover it at all. Enjoy! Oh wow! And it wasn’t dry at all?